WARNING - Hot Air Ballooning Changes Lives!!! At the club AGM on 26th October 2016, the Tony Patey Trophy was handed to Steve Bray for his role as Chairman of the Capital Balloon Club - the flying wing of the club!! 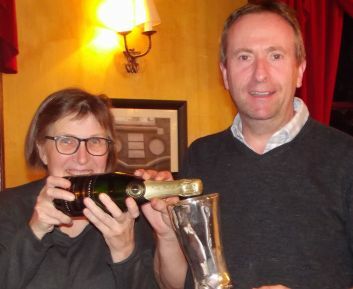 The attached photograph shows Christine Seager, a long standing supporter of the London Region, and Steve about to make good use of then Trophy.